This issue of Healthcare Quarterly introduces a three-part series featuring international perspectives on health service delivery models that improve system integration and ensure seamless services and better coordination. The series, developed by Ontario's Change Foundation, will feature Chris Ham, chief executive of the London-based King's Fund think tank; Geoff Huggins, director for health and social care integration in Scotland; and Helen Bevan, chief transformation officer of England's National Health Service. Health systems across Canada are increasingly focused on the gaps and discontinuity in care that contribute to ongoing problems for so many people, particularly those who are chronically ill or otherwise vulnerable. It is generally acknowledged that the system needs to be more integrated, with seamless services and better coordination all around. The question of the best way to achieve integration, however, remains open. In search of answers, The Change Foundation, an Ontario-based independent health policy think tank, felt it would be timely to review and discuss how other jurisdictions are handling efforts to integrate care. Together with partners from the University of Toronto – the Institute of Health Policy, Management and Evaluation, the Health System Performance Research Network and the Dalla Lana School of Public Health – it launched a series of discussions on effective approaches to integrating care in late 2017 to glean insights that might help improve healthcare in Canada. Three speakers took part in the series: Chris Ham, chief executive of the London-based King's Fund think tank; Geoff Huggins, director for health and social care integration in Scotland; and Helen Bevan, chief transformation officer of England's National Health Service. Common ideas echoed through their talks and the lessons they offered will likely resonate across Canada as well. All three speakers said a shift toward integrating healthcare is almost always triggered by a crisis of quality, sustainability or both. They all advised focusing on services rather than trying to overhaul institutions. But unlike in recent decades, when crises led to pressure to standardize care, Ham, Huggins and Bevan called for focusing on local solutions because success will come from letting front-line workers develop new ways to care for the people and communities they know, not from centralized planning. And they all said successful change is based, above all, on good relationships, trust and altruism. Perhaps that is the most important lesson of all for Canadian providers looking to integrate care – forget the myriad divisions of healthcare, within and among institutions and provinces and professions and patients – be honest and work together for the good of patients, caregivers, the public, providers and the system as a whole. The series begins with Chris Ham's presentation looking at international examples of integrating care. Watch for commentaries from Geoff Huggins discussing integrating care in Scotland later in 2018 and Helen Bevan's thoughts on bringing integrated care to the National Health Service (NHS) in England in early winter 2019. Health providers in Ontario and health systems across Canada generally acknowledge that care needs to be more integrated and better coordinated to achieve the quality, effectiveness and sustainability of services patients and citizens expect and deserve. Chris Ham, chief executive of the London-based King's Fund think tank and a long-time supporter of integrated care, explained that observations he has made around the world have convinced him that a lack of coordination is preventing patients from receiving the best possible care. Meso-level integration, Ham and Curry say, focuses on particular groups of patients, such as older people or patients with one or more long-term conditions. They report that evidence from North America and Europe shows that integrating healthcare and social services for older people is beneficial and in many places is an essential part of integrated care programs. As Figure 1 below shows, building an emphasis on health and well-being into every contact with an individual is critical, but it is at the population level that integration moves beyond healthcare and starts building links to other determinants of health, such as housing or social support. Much of what Ham talked about in the Toronto meeting was the importance of links across organizations and systems. Even more important are the links between the front line staff providing care and their relationships with each other and people receiving care. The preoccupation with institutions must be left behind, he said, because "care is about people, their families and carers, and how we can best meet their needs." It is no coincidence that some of the most successful examples of integrated care are in relatively small communities – small enough, at least, that many of the physicians and others involved already know each other. This represents the importance of relationships that allow collaboration to flourish and encourages "trust and altruism." Altruism, in this context, is the willingness to help others reach their objectives, Ham said, adding, "It's easy to say but very hard in practice. It means you are thinking about how the whole system works and not just the organizations that make up the system." That focus on the system is especially important for leaders, who must stop thinking only in terms of their organizations, and learn to lead across the system and with others. It sometimes takes a crisis to bring out that altruism and shift to a focus on integrated care. Ham gave the example of Torbay, a retirement destination in southwest England, where local health providers acted to improve integration of care after the town's social services received a failing grade in a review. In response, general practitioners (GPs) started to build integrated teams to focus on the complex needs of the town's elderly population. Led by physicians, the teams include nurses, occupational and physical therapists, social workers and mental health professionals. Together, teams develop and deliver care designed to keep patients out of crisis. Hospitalizations went down and demand for home care increased, reflecting efforts to keep people living independently. Within its meso-level focus on elderly patients, Torbay also added a micro-level integration feature, creating a new position, called care coordinators. Their job is essentially case management, organizing all the different types of care a patient needs. According to Ham, they are a crucial element of the success of the integrated care project. Notably, they are not educated professionals but rather high-school graduates with six months of training. Their skill is what Ham calls the "contact sport" of integration: they can understand patients' needs and how to meet them by drawing on available professional skills in the team. Care coordinators are an economical and efficient option for ensuring seamless care. 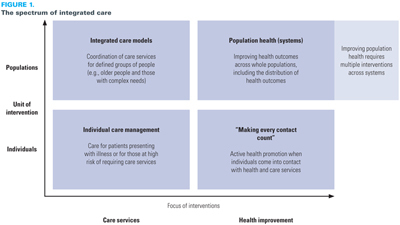 There are many integrated care models in Britain, but successful ones share a feature with the Torbay model: they are created locally to respond to local conditions. "Integrated care in Bristol has to be made in Bristol. You can't drag and drop from somewhere else," Ham said. There are other shared features: generally, the most effective efforts at integrated care start small, perhaps in a neighbourhood, or a town of 30,000–50,000 people. Successful integrated systems are flexible, prepared to try new ideas, fail fast, learn, make changes and move on. Ham told the meeting he had seen few places so close to success in creating an integrated system from one that was badly fragmented as Canterbury health board in New Zealand (centred around the city of Christchurch). Growing demand for care meant that Canterbury would have needed another 500-bed hospital by 2020, as well as 2,000 more long-term care beds added to the 4,500 already there. Another 8,000 staff would also have been needed. Simply put, it was going to be unaffordable and unsustainable (Timmins and Ham 2013). Canterbury made numerous changes in response, including introducing Lean methods, developing care teams and hiring care coordinators. The development Ham highlighted the most, however, was the bringing together of hospital-based specialists and GP to create HealthPathways, triggered by a separate crisis, long waiting lists. In an effort to shorten them, hospital and community doctors tackled the problem together. "They said, what would good look like? How could we do that? How could we improve?" Ham said at the Toronto meeting. "The powerful thing was not the product, it was the process, GPs and specialists talking about how they could improve care." It was all bottom-up, Ham noted. As a result of the HealthPathway work (which continues, with regular introduction of new pathways and biannual auditing of those in place), GPs are tending to do more advanced care, such as removing skin lesions or giving lung-capacity tests, which formerly would have been done by specialists. They do more prep work, too, so when a patient is referred, tests and imaging will be ready, freeing up specialists "to do what only they can do." If a GP makes a referral that does not follow the pathway, the patient is sent back. "It was a difficult process, lots of arm wrestling, lots of argument at different points, but they got there in the end," Ham said. The new model had a hub-and-spoke design, where eight hospitals were designated hyper-acute stroke centres, operating 24 hours a day, to which every suspected stroke patient was taken directly; other hospitals continued to provide step-down care. Part of the selection process for the hubs was that no Londoner would live more than half an hour's ambulance ride from a centre. A study (Morris et al. 2014) published by the BMJ found significant reductions in three-, 30- and 90-day risk-adjusted mortality (calculated as 168 fewer deaths over the two years of the study) and a 1.4-day reduction in hospital stays. "It's a great example of change that resulted from top-down leadership at a regional level, but bottom-up engagement and commitment from clinical leaders. It's about stroke care, but it could have been cancer care or anything else, for that matter," Ham said. So what factors help integration projects succeed? Figure 2 summarizes Ham's understanding after years of observation. How an integration plan is executed is critically important, Ham said. As his chart shows, he sees a divide between the technical challenges of integrating care and the challenges that hinge on human relationships. Efforts at integration often bog down in the business details of bringing organizations together. Even where people are committed to the concept of integration, trying to reconcile multiple different systems, from IT to budgets to actual care practices, can burn up immense amounts of energy and time – and the reality is, organizations can officially be integrated but still have as many silos as before. For that reason, Ham recommends focusing on integrating services, not organizations. Although Ham emphasized that successful models of integration are not mandated by government, the Ontario government is pushing for more integration in healthcare here, and health leaders at the meeting were naturally curious about what the role of government should be in advancing integrated care. "Ministries of health must lead, but there must be alignment across many levels," Ham explained. Governments should be focused on giving the extra support the system needs as it invests time and effort in integrating, leaving organizational issues for others. Nothing is more important to the success of integration than the support and commitment of the staff involved, Ham said. He quoted David Meates, Canterbury's chief executive, saying, "It's all about the people, the people, the people." He partly meant the people receiving care, Ham said, but he was particularly referring to the staff who delivers the care, and whether they have a sense of ownership and leadership in the changes. One way to encourage staff is to demonstrate success. Participants need to see the potential for improvement to get involved in the first place, but to keep them engaged, you have to show proof that their work is making a difference. "As Kotter (1996) taught us a long time ago, demonstrating success helps you generate more success. It builds competence and the belief something can be done, something can be achieved," Ham said. Participants did not leave the meeting with a recipe for integration, but they understood that was not a bad thing, because Ham had shown them how any number of different ingredients can be combined to produce a successful version of integrated care. In fact, he had shown that ingredients have to vary, to reflect the needs of the local population, to recognize the ways regional providers have chosen to build collaboration and to secure the trust and respect that evolvefrom a community tackling a shared problem. But for all his emphasis on variation, Ham also drew strong parallels: there is generally a crisis that precipitates change. change is not mandated from higher levels and integration must be created at the local level and tailored to local needs. He also showed that even at the macro level, when whole networks or systems take on integration, they generally make it work by focusing on the micro level – a given group, such as seniors, or a particular health issue, such as stroke or cancer care. Perhaps his strongest message was that a focus on people, the care they need and their families is the best guide to what changes should be made, and the best people to do the integrating are the providers closest to patients. Ham's insights were echoed by the subsequent speakers in the series, Geoff Huggins of Scotland and Helen Bevan of England, who also warned against starting with the technicalities of merging institutions and urged a focus on the patient. Empowered staff who are listened to, all agreed, will be committed and will work to make integration a success. Cathy Fooks is the president and CEO of The Change Foundation. Based in Toronto, the foundation is dedicated to improving the patient and caregiver experience in Ontario's healthcare system. Jodeme Goldhar is the executive lead of Strategy and Innovation at The Change Foundation, adjunct faculty at the University of Toronto, Institute for Health Policy, Management and Evaluation and senior associate for The International Foundation for Integrated Care (IFIC). Jodeme's focus is to advance the exchange of knowledge, information and practice to improve the experience between patients, caregivers, health service providers, policy makers, funders and researchers to drive integrated systems of care. Walter P. Wodchis, PhD, is professor at the Institute of Health Policy, Management and Evaluation at the University of Toronto and research chair in Implementation and Evaluation Science at the Institute for Better Health, Trillium Health Partners. His main research interests are health economics and financing and health care policy evaluation. Dr. Wodchis has lead several studies examining the complex needs of high-cost patient groups, the implementation of integrated care programs to address those needs, and evaluations for a number of integrated care programs in Ontario. G. Ross Baker, PhD, is a professor in the Institute of Health Policy, Management and Evaluation at the University of Toronto and program lead in quality improvement and patient safety. Ross is also co-lead for IDEAS (Improving and Driving Excellence Across Sectors), a large quality improvement training program in Ontario. Ross's recent research projects include an edited book of case studies on patient engagement strategies, a demonstration project that assesses an innovative approach to monitoring and measuring patient safety and studies of the implementation, scale and spread of integrated care initiatives. Jane Coutts is an Ottawa-based writer and editor specializing in healthcare issues. She is a former journalist and also worked on knowledge transfer at the Canadian Health Services Research Foundation. Adalsteinn (Steini) Brown, dean of the Dalla Lana School of Public Health at the University of Toronto. Chris Ham, the chief executive of the King's Fund, an independent charity working to improve health and care in England. Curry, N. and C. Ham. 2010. Clinical and Service Integration: The Route to Improved Outcomes. Retrieved January 23, 2018. <https://www.kingsfund.org.uk/sites/default/files/Clinical-and-service-integration-Natasha-Curry-Chris-Ham-22-November-2010.pdf>. Morris, S., R.M. Hunter, A.I.G. Ramsay, R. Boaden, C. McKevitt, C. Perry et al. 2014. "Impact of Centralising Acute Stroke Services in English Metropolitan Areas on Mortality and Length of Hospital Stay: Difference-in-Differences Analysis." BMJ doi: https://doi.org/10.1136/bmj.g4757. Timmins, N. and C. Ham. 2013. The Quest for Integrated Health and Social Care: A Case Study in Canterbury, New Zealand. London, UK: The Kings Fund. Retrieved January 29, 2018. <https://www.kingsfund.org.uk/sites/default/files/field/field_publication_file/quest-integrated-care-new-zealand-timmins-ham-sept13.pdf>.